Hanover Scotland has been working in partnership with Housebuilder Keepmoat Homes to deliver 10 affordable homes as part of the new 42 house Lyons Gate development, for which Keepmoat Homes is the main contractor. 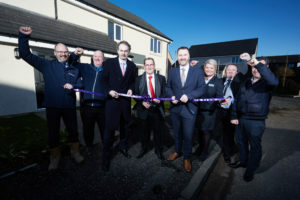 The Hanover development – which received £763,000 investment from Scottish Government through the Affordable Housing Supply Programme – comprises of eight cottage flats and two semi-detached houses for rent, and responds to local demand for quality and affordable housing in the town. Sandy McBride, Regional Managing Director for Keepmoat Homes, describes how the extensive regeneration of the area has been a key part in attracting interest. He said: “Before we even began the construction of new homes at Lyons Gate, we invested heavily in ground improvement works and consulting with the local community to ensure we delivered the right product. Over recent years the demand for new housing in the area has continued to increase and we are pleased to be working in partnership with Hanover Housing Association and South Ayrshire Council to be able to meet this demand. Housing Minister, Kevin Stewart said: “I am delighted to see the completion of the Lyons Gate development, which will bring great benefits to the area. It will not only provide high quality, affordable accommodation, but breathe new life into the community. “Supported through our Affordable Housing Supply Programme, it is a great example of how the Scottish Government is helping provide the right homes, in the right places, and to a standard anyone would be proud to call home – a core part of our drive to make Scotland a fairer and more prosperous country.